Recover My Files will search and locate deleted Microsoft Outlook PST and WAB (Windows address book) and PAB (Personal Address Book) files which have been emptied from or bypassed the Windows Recycle Bin. Recover My Files will NOT recover individual messaged deleted from within Microsoft Outlook. 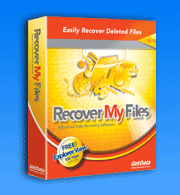 If you need to recover deleted messages try our Email Recovery Software for Microsoft Outlook. PST files are very complex and in some instances recovered PST files will not function until they have also been repaired. This is done by running a program called 'scanpst.exe' (also known as the 'Inbox Repair Tool') which is installed by default on all Windows computer systems. Use Recover My Files to find your deleted PST file. If errors occur when you try to access it, use the Inbox Repair Tool to fix it. Once you have recovered and repaired the file you will once again be able to open the file in Microsoft Outlook. Recover My Files will search for and locate deleted Microsoft Outlook Express DBX files which have been emptied from or bypassed the Windows Recycle Bin. The download version of Recover My Files will allow you to see the contents of the recovered DBX file, including the number of messages, the 'to' and 'from' address fields, the subject and the date each message was sent and received. Recover My Files will not recover individual messaged deleted from within Microsoft Outlook. If you need to recover deleted messages try Recover My Email for Outlook Express. We provide a data recovery service for corrupt or damaged Microsoft Exchange EDB files.